Telstra launched a new driver safety program at the V8 Supercars Clipsal 500 Adelaide Race over the weekend. 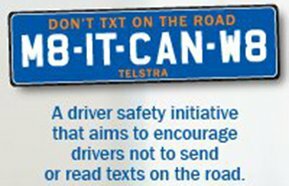 Telstra is inviting everyone to take a stand against texting on the road through the M8 IT CAN W8 driver safety initiative. The campaign aims to encourage drivers not to send or read texts on the road. Telstra's goal is to get a 'Thumbs Up' from 50,000 drivers on Facebook pledging not to text on the road by Fatality Free Friday which is the 27th May. Please show your support by Liking the M8 It Can W8 facebook page at www.facebook.com/m8itcanw8.